Do you feel like your computer is running slow or taking longer to boot? Computers get cluttered. One source of clutter on your computer is unneeded programs. These programs can run in the background hogging memory and slowing down the programs that are important to you. Sometimes a program is responsible for bugging you with unwanted ads. In short, they waste your time. Removing these programs can make your computer faster, more efficient, and more reliable. The best way to get rid of programs clogging your system is to click the start menu, go to your Control Panel, then click Uninstall a program or Programs and Features. If you know what the program is but never plan on using it again – Maybe you downloaded it by mistake, meant to use it and never did, or the program doesn’t work properly anymore. Any program that has “Toolbar” in the name – These programs slow down web browsers. This includes AOL & Yahoo toolbar. Even if you use AOL or Yahoo, you do not need the toolbar slowing down your computer. Any program that mentions “Search”, “Deals”, “Value”, “Bargain”, or “Click” – These programs are spyware that basically hijack your computer and tell it to go to their site whenever you mistype a web site or pop up advertisements. They run in the background and take up lots of memory. 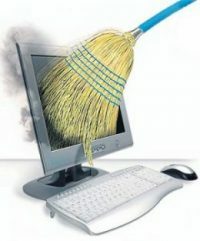 Programs that promise to cleanup your computer – Cleanup programs can be dangerous in that most contain some sort of spyware, and those that don’t can potentially crash legitimate programs. If you decide to use them, always immediately remove them when you are done. Extra antivirus software – Pick one and remove any others. The two programs may conflict with each other, every time you download a file, both will try to scan it. Conflicts could result in other programs failing to work and Windows becoming less stable.